How do you recommend reheating the meat? Can you do this in a chafing dish or the oven? 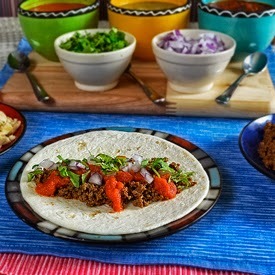 I am looking to do a similar taco bar for 100 people and want to prepare the meat the day before. I used 6 quart slow cookers with a little water in bottom, once it got hot I turned the setting to warm and it was good to go all day. Thank you for posting this - so helpful! Do you think I can make the meat 3 days before and then freeze it? If so, should I reheat it in the slow cooker? I would definitely freeze the meat once it's cooled immedietly after cooking it if you're going to serve it three days later. I would then thaw it some in the microwave before putting it in the slow cooker to get hot again. approx. how many servings did the 20 lbs. make? Rob - A general guide to cooking for a crowd is plan on 4 oz. of meat per person. 4 people for every pound. 4 x 20 = 80 people. That 4 oz portion will provide meat for at least 2 tacos. Make sure you plan for that. What ratio of hard/soft shells do you recommend? Deborah - I have never put out hard shells for a large crowd, only soft. I do put out tortilla chips so people have the option to make a plate of nachos though. (approx. 2 oz per person) I wish I could answer your question better but I would only be guessing.